Maryland's Fishing Report: Strippers Are Here! We are now deep into a fall fishing pattern, with classic cold fronts and gusty northerly winds. 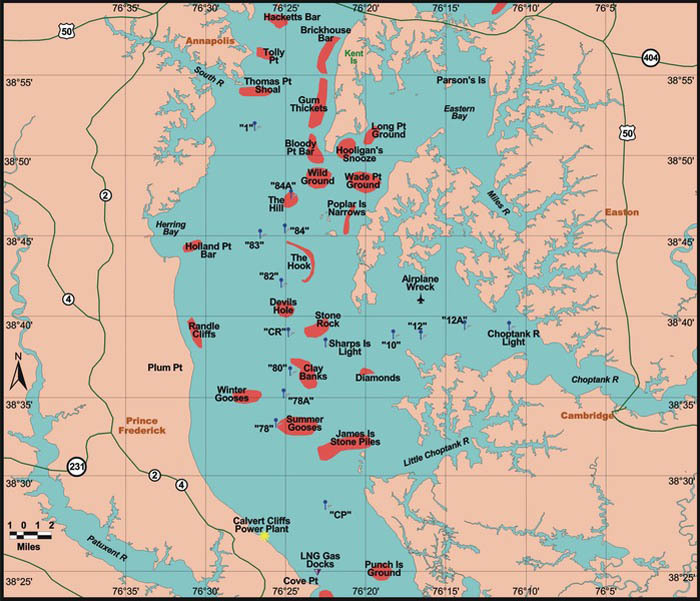 This past weekend, anglers who were able to get out before or after the winds found good striped bass fishing over a wide area of the Chesapeake Bay, from Love Point down to the Calvert Cliffs gas docks area. These shorter, cooler days are a sign for bay fish to prepare for winter conditions or migrate out of the bay. Right now there is plenty of cool waters and oxygen from surface to bottom. 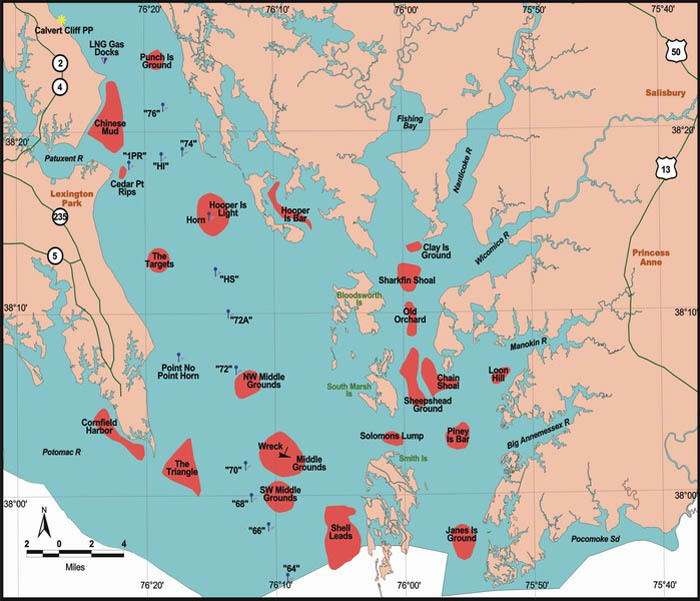 For tidal rivers and main bay areas, focus on areas with good structure such as underwater points, oyster bottom, reefs, channel edges, and large schools of baitfish. Hungry rockfish will also roam the nearby shallow water areas looking for an easy meal. It will be windy and rainy this weekend, and temperatures continue to drop. Expect sunny to partly cloudy conditions most of the other days with air temperatures in the mid to upper 50s with nighttime temperature in the 40s. At the Maryland Department of Natural Resources and National Oceanic and Atmospheric Administration buoys, water temperatures continue to rapidly cool, with the Susquehanna River now at 55 degrees, Annapolis now at 62 degrees, and Gooses Reef and Point Lookout both at 63 degrees. Expect water clarity in the main bay to slightly improve until Friday when another round of rain enters the area. Winds will reduce water clarity along near shore areas. There will be above average tidal currents all week as a result of the full moon Oct. 24. For the full weekly fishing conditions summary and more, please be sure to check out Click Before You Cast. 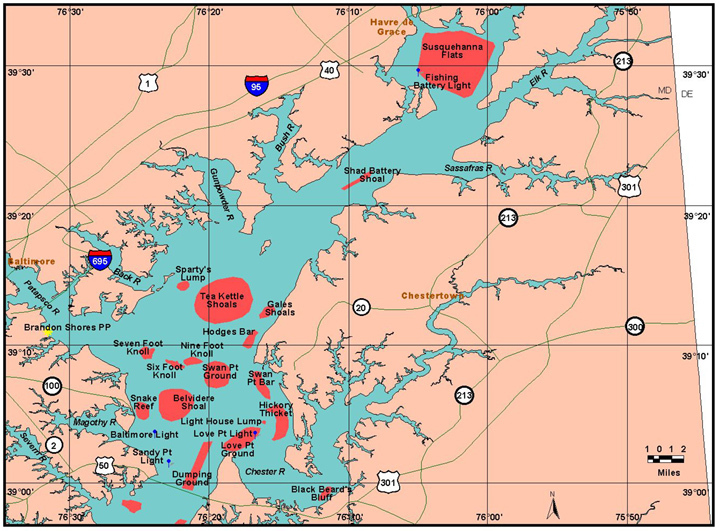 Water conditions at the mouth of the Susquehanna River should be slowly improving as the freshwater flows subside, and the Conowingo Dam is currently operating with no spill gates open. Water temperatures are down to the low 60s. With the water temperatures now too cold to find live spot, anglers are either chumming and chunking with menhaden or fishing with artificial lures. Chumming is still popular and successful at the usual spots in 25 feet to 35 feet of water around the points including Swan, Love, Podickory, Hacketts and Thomas Point. Trolling has been a good option along channel edges in the bay or river mouths with umbrella rigs using swimshads or bucktails as trailers. Some anglers are also now bottom bouncing and trolling deep with bucktails as the fish have moved deeper in the water column. The Chesapeake Bay Bridge rock piles and piers continue to be a popular place to fish, and this should continue into December. Jigging with soft plastics has been one of the best ways to fish for the suspended striped bass that are holding at 25 feet to 35 feet deep. Live-lining eels is another great way to target the striped bass holding near the bridge piers. Water temperatures at Thomas Point are down to 62 degrees and baitfish are moving down out of the tidal rivers on outgoing tides with schools of striped bass waiting for them along channel edges near the mouths of the major tidal rivers in the mainstem bay. Pods of breaking striped bass are showing up in various locations in the middle bay region, including Poplar Island and Bloody Point. A good set of binoculars is an important tool to keep on the boat this time of the year. Light-tackle jigging with metal or soft plastic jigs is fun and productive. Work your jig underneath breaking fish or to suspended fish along channel edges. Trolling is a good option with a variety of umbrella rigs behind inline weights with swimshad or bucktail trailers. As the water cools, some trollers are now bottom bouncing with heavy weights and bucktails and plastics on lead heads. Live-lining is about over except for a few folks retaining bait in holding pens and tanks. 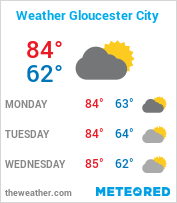 Cooler water temperatures have striped bass freely moving about in the bay and tidal rivers this week. The shallow water fishery for light tackle anglers casting from boats or shore is very good. The mornings, evenings, and overcast days tend to be the best time to fish. Topwater poppers are the most fun for casters, with crankbaits, swimbaits and paddle tail jigs also producing. This is an optimum time to fish shoreline structure such as old submerged breakwaters, rip-rap, pilings, stump fields or prominent points. 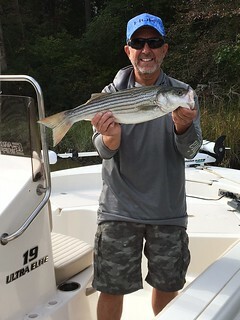 Striped bass fishing opportunities are lighting up in the lower bay region with the colder temps, and a hot bite has developed in the Gas Docks area off Calvert Cliffs. There continues to be good chumming for striped bass and a few bluefish at the mouth of the Potomac River and near St. George Island. The fish tend to be suspended at about 25 feet. Live-lining with spot is winding down as the spot makes a mass exodus with the recent cold fronts. Trolling has been a very popular way to fish for a mix of striped bass, and the remaining late season bluefish. Small spoons behind planers along with a mix of bucktails, swimshads and hoses have been the hot lures, but umbrella rigs will dominate the trolling scene as water temps drop. 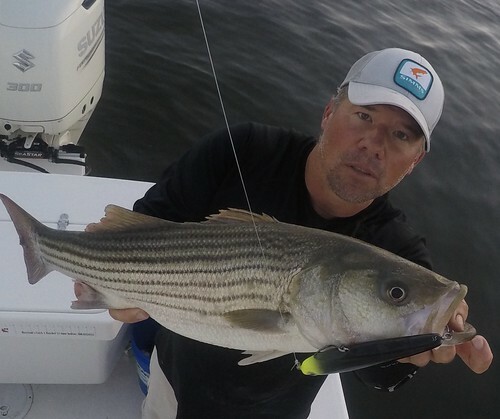 Trolling bucktails dressed with sassy shads and swimshads around shoreline edges in the lower Potomac, St. Marys River and Patuxent rivers is a good way to target striped bass. Breaking fish are showing up in the usual spots such as the Cedar Point Rips and Gas Docks area. Casting jigs and working them underneath the surface action is a good path to larger striped bass. Spanish mackerel are mostly gone and a few bluefish are hanging around. Fishing the shallower waters along shoreline structure in the tidal rivers on both sides of the lower bay is a fun, light-tackle way to fish for striped bass from now into November. Casting topwater lures, jerkbaits, crankbaits or swimshads to structure such as docks, piers, rocks and marsh edges is a fun way to fish. This week will probably be the last shot at trotlining large male crabs in 10-20 feet of water. As local Marylanders know, the crabs are heavy during the late fall season as they prepare for overwintering. Expect fishing for cold water species, such as northern pike and walleye to improve with the passing cold fronts. 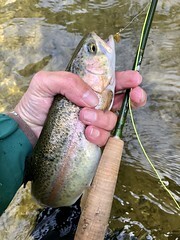 The trout program personnel are stocking fish in many of the traditional put and take trout waters throughout the state. Please keep checking our website for stocking updates in your area. Avid late-season anglers and observers along Maryland’s ocean coast have reported the striped bass migration is still far to north off northern New Jersey, Long Island and southern New England. Resident striped bass in the coastal bays are still being caught around the Route 50 Bridge, and flounder fishing is still productive in the East Channel. Headboats were seeing some good days for both flounder and sea bass on the ocean artificial reefs and shipwrecks when winds are calm enough to allow passing through the inlet and fishing on ocean structure. At the offshore lumps and canyons, dolphin fishing has been excellent for the entire fall season and they are being caught near lobster buoys and any kind of floating debris or weed lines. They are mostly being caught on light spinning tackle and small jigs that are often tipped with a little piece of squid. White marlin were being caught and released from the Washington Canyon south to the Norfolk Canyon prior to the big blow, but these highly migratory fish will continue to move south on a daily basis. This week’s Maryland Fishing Report was compiled by Erik Zlokovitz.